Bringing a new baby into your life and home marks the start of new habits and routines for parents. This applies for any pets who have been used to being “the first child”. In this article we look at aspects to consider when you bring a new baby home to meet your dog. There are going to be many changes for you and your dog. Routines, walks and meal times may change with the arrival of a new baby. Your dog will need to get used to new smells, sounds and objects. Your attention may be diverted so we encourage taking some time to think about what will change for your dog. There are things you can do to help your dog adjust to life with a new baby. These adjustments or new behaviours are best put in place months or weeks before the baby arrives, rather than a few days before. This will help to make this exciting time enjoyable for the whole family, your dog included. Ideally, you will want your dog to be well trained to sit, stay, lie down, come when called and not jump up. Having good training and behaviour in place will help to make this time much easier for everyone. It is likely you will have less time to spend with your dog once the baby arrives. Get him used to spending some time on his own or lying quietly on his own each day in the months before the baby arrives. Use treats and/or positive encouragement to reward him for these new good behaviours. You could consider familiarising your dog with the new baby equipment (pushchair and highchair.) Some new parents walk the dog with the pushchair before the baby has arrived. We’ve also heard of new parents who introduce a doll as a pre-baby to help with the transition. 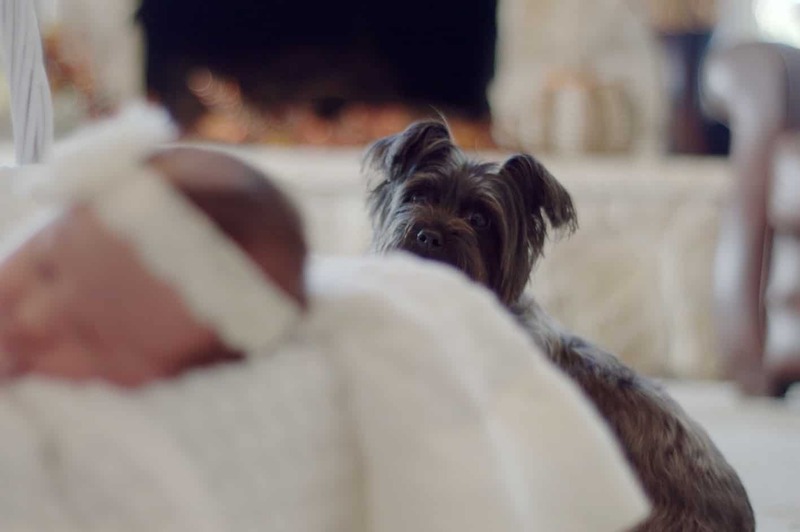 Once the baby has been born, you could bring home a blanket or piece of clothing from the hospital for your dog to smell before the baby’s arrival. When you first arrive home, it is very important to greet your dog on your own without the new baby. You could take it in turns to be with the baby in the car whilst you each have a chance to greet and have cuddles with your dog. Your dog will have missed you and will know that something is different. Dogs are incredibly preceptive. We don’t know if they undertand that there is a new baby about to “join the pack”, but they may have sensed signals of something for some time. A popular way to introduce your dog and baby is to sniff the baby’s feet whilst on the lead (or an alternative control method). Even with the friendliest and most trusted dogs, it makes sense to take these introductions slowly and carefully. Over the coming days, you would then proceed to being off the lead for sniffs and cuddles. It will be important for your dog to feel positive around your baby making good associations in his mind so perhaps use treats to praise and reinforce good behaviour. Your dog will be aware of a new pack member. You don’t want him to feel that the arrival of the new baby means no time for him. It might be easier for you to give him attention when the baby is asleep. But also try to balance this with some attention whilst the baby is awake. You don’t want him to feel that it’s me or the baby. There is time and love for him and the baby. Make sure your dog has toys to play with to stop him getting bored or frustrated. Sometimes it’s inevitable that walks will be shorter, or that there will be less time for him. If he accidentally picks up a baby toy, change it for one of his toys. Try not to tell him off or raise your voice and create negativity. Going for a walk is one of your dog’s greatest joys. Taking your dog for a walk with the baby in the pushchair can be a very fulfilling aspect of your day. It will provide fresh air and exercise for you, your dog and your baby. It also provides an opportunity to create a healthy routine for all you to enjoy together whilst forging strong family bonds and experiences. This is an exciting time for you and your family. It is normal to wonder “Will my dog be jealous of the new baby?” or “Will my dog accept the new baby?”. With some thought and preparation about your dog’s needs then your baby’s arrival should hopefully be a joyous time for you all. If you are very worried about your dog, consult your vet for more advice.